This is a great recipe for the classic southern pecan pie. Beat eggs, corn syrup, sugar, butter, vanilla and salt in medium bowl until well blended. Arrange pecan halves evenly in bottom of pie crust. Carefully pour egg mixture over pecans. Bake in center of 350°F (175°C) oven until knife inserted midway between center and edge of pie comes out clean, 45 to 55 minutes. Cool on wire rack. 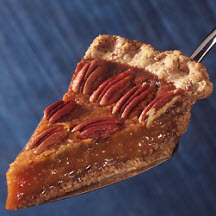 Tip: Pecans are the traditional favorite in this popular cousin of the custard pie, but other nuts can be substituted. Try it with walnuts, cashews, macadamias or your favorite nut. Nutritional Information Per Serving (1/8 of recipe): Calories: 586; Total Fat: 36g; Saturated Fat: 9g; Cholesterol: 121mg; Total Carbs: 65g; Fiber: 2g; Protein: 6g; Sodium: 309mg.